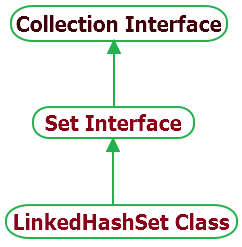 LinkedHashSet Class extends extends HashSet class and Implements Set interface in collection interface hierarchy. LinkedHashSet implementation differs from HashSet as it maintains doubly-linked list running through all of its entries. It maintains element's entries in set as per it's insertion order. So it will allow you insertion order iteration over the set. So when you iterate over LinkedHashSet, In which order it will return elements? Answer is As per it's insertion order. So you will get same copy of elements with the order how they inserted in set. Bellow given example will show you basic methods of LinkedHashSet and it's usage. // Get size of LinkedHashSet. // Check if LinkedHashSet is empty? // Remove item from LinkedHashSet.